Pocket Sized, Fun and Easy to Use. 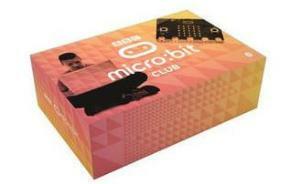 Get creative, get connected and get coding with the BBC micro:bit Club 10 Pack. Ten complete sets each containing all the parts and inspirational ideas to get started with the BBC micro:bit. Each BBC micro:bit contains 1x BBC micro:bit, USB cable, battery holder and 2×AAA batteries along with a Quick Start Guide featuring 4 fun ideas all in a retail ready pack. You can use your BBC micro:bit for all sorts of cool creations, from robots to musical instruments - the possibilities are endless. This little device has an awful lot of features including 25 red LED lights that can flash messages, two programmable buttons that can be used to control games or pause and skip songs on a playlist, detect motion and tell you which direction you're heading in, and even use a low energy Bluetooth connection to interact with other devices and the Internet! Microprocessor 32-bit ARM® Cortex™ M0 CPU. A 5x5 LED matrix with 25 red LEDs to light up and can display animated patterns, scrolling text and alphanumeric characters. Two programmable buttons. Use them as a games controller, or control music on a smart phone. On-board motion detector or 3-AXIS digital accelerometer that can detect movement e.g. shake, tilt or free-fall. A built-in compass, 3D magnetometer to sense direction and your movement in degrees also the presence of certain metals and magnets. Bluetooth® Smart Technology. Connect the micro:bit to other micro:bits, devices, phones, tablets, cameras and other everyday objects. Five Ring Input and Output (I/O) including power (PWR), ground (GRD) and 3 × I/O. To read values from sensors and control things like motors or robots. 20 pin edge connector: This allows the micro:bit to be connected to other devices such as Raspberry Pi, Arduino, Galileo and Kano through a standard connector. Micro-USB controller: This is controlled by a separate processor and presents the micro:bit to a computer as a memory stick. System LED × 1 yellow. System push button switch × 2.